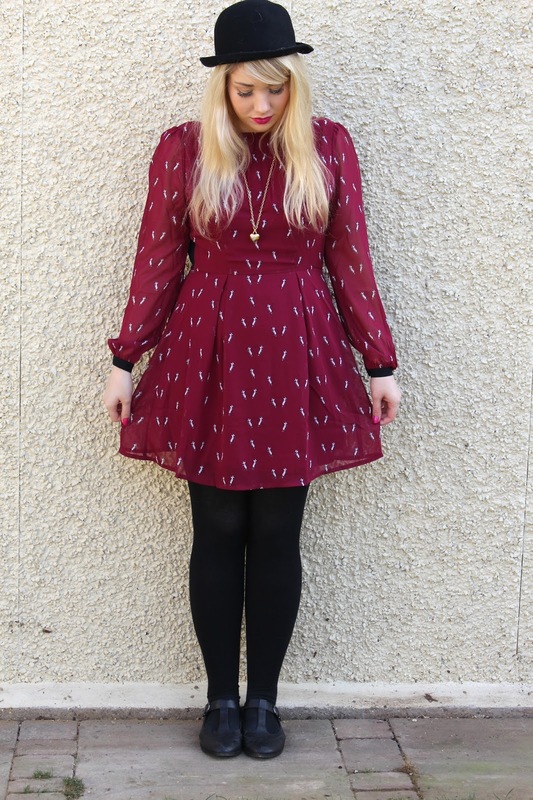 Oh would you look at me, doing yet another outfit post?! Seeing as the sun has been out a lot more recently, I've been getting back into the swing of things with outfit posts and I hope you're enjoying! I've been meaning to post about this beaut of a dress from Sugarhill Boutique for a while now and I think you can see why - how gorgeous is it?! It's such a flattering fit and the little mice in love on it make me so happy. Their little tails even make love hearts! The best thing? It's currently in the sale for a total steal. Get in quick though as there aren't many left in stock! I paired it with some thick tights, as although the sun is out I'm not quite ready to make bare legs a regular thing, as I feel the cold like nobody's business. I was having a bit of a flat-hair-day so I popped on my trusty ASOS bowler hat (it is amazing at hiding roots too, yay) and my cute dolly shoes from New Look and I was good to go. I've also been wearing the necklace my lovely friend got me for Christmas constantly recently - it's just so easy to wear and looks so pretty on. Gotta love a bit of JC!